This periodic “advice column” addresses common questions about the Hickory Ridge village covenants and other property maintenance concerns. To keep it interesting, your questions are answered by a local feline who is surprisingly well-versed in covenant issues. 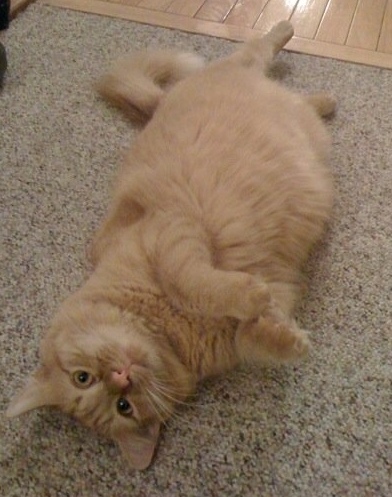 This cat may or may not be an overweight orange tabby named Boo Boo that lives with the Village Manager. Send your burning questions to jduvall@hickoryridgevillage.org. This is a repost of a Covenant Cat question from June of 2014. What can I do about my neighbor’s overgrown tree? It’s growing over the fence into my yard, and my neighbor won’t trim the branches. Covenant Cat does some yoga stretches before tackling tough covenant questions. I hear about issues like these regularly. Luckily, there is an easy solution to this problem! If your neighbor is unwilling to trim the tree branches that hang over your yard, it is purrfectly acceptable for you to do it yourself. Maryland follows the “Massachusetts Self-Help Rule,” which is based on the outcome of a Supreme Judicial Court of Massachusetts case [Michalson v. Nutting, 275 Mass. 232, 175 N.E. 490 (1931)]. This court ruling states that a property owner can cut off branches which are intruding over his property as long as he doesn’t kill the tree. You do not need to apply to the Resident Architectural Committee before you trim trees, so you can get to work right meow! Good luck!